Now that you have purchased the iPhone 6s or iPhone 6s Plus, the first thing you want to import to your new iPhone must be the contacts because the iPhone 6s or iPhone 6s plus cannot live up to its name as a phone if there is no contact item at all. 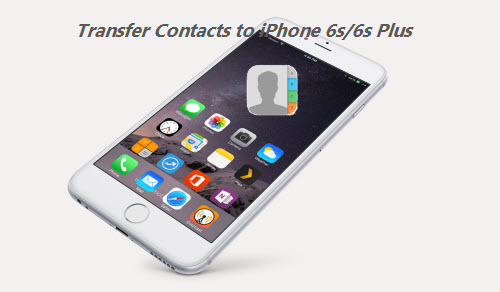 So it is necessary to find an appropriate way to transfer the contacts items to your new iPhone 6s/6s Plus according to where you have saved your contacts previously. Next, I am going to respectively demonstrate how to transfer the contacts in different ways. Go to Settings>Mail, Contacts, Calendars>Add Account, tap to select the service you want to import contacts from. If your service is not listed, you may be able to add contacts by tapping “Other” and selecting “Add CardDAV Account”. Here I would like to take adding a Gmail account for demonstration. Enter in your account information. You will need to enter your account username and password. After adding the account, tap the Contacts slider to turn on Contacts syncing. The contacts from the new account will be added to your Contacts List. Connect your iPhone to your computer and launch iTunes. Select your iPhone. Click the Info section and scroll down to the bottom of the screen to the Advanced section. Select the service or app you want to sync contacts from. Click the Apply button to begin syncing. If you have a backup of your old iPhone data in iTunes, all you need to do is to “Restore from Backup.” Please make sure you have synced your old iPhone to iTunes and created an iTunes backup. Click Restore iPhone on the Summary Panel. If you are dealing with this on a Mac, right click on your device from the sidebar. Click on Restore from Backup. Please remember to turn off “Find My iPhone at first. Go to www.icloud.com on your computer, and log in your iCloud account with your Apple ID and password. Click “Setting” button on the left corner and choose “Import vCard”. Then choose the vCard (.vcf file) from your computer, and click “Open”, then the vCard contacts will be added to your iCloud Contacts automatically. Then you just succeed to import vCard to iPhone, so go to your iPhone Address Book to check the contacts. Contacts can be exported to computer through iFonebox and transferred to iPhone 6s/iPhone 6s Plus selectively. Install and launch the full version of iFonebox and then choose an iTunes backup from which you want to migrate the contacts to new iPhone 6s/6s Plus through the recovery mode of “Recover from iTunes Backup”. Choose Contacts to export by clicking on the related icon for Contacts app. Preview and select whatever you want to recover. Connect your iPhone 6s / 6s Plus to your computer and hit the button of “Recover to Device”. Check your contacts app to see whether the contacts extracted from iTunes backup have been transferred to your new iPhone 6s and iPhone 6s plus successfully. By the way, I believe this is the safest and easiest way to transfer contacts to newly purchased iPhone 6s and iPhone 6s Plus. 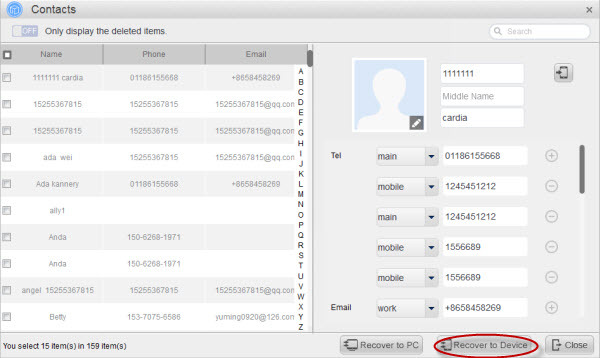 How To Recover Deleted Contacts From Without Backup? This entry was posted in iPhone 6S and tagged import contacts from iCloud, transfer contacts from gmail, transfer contacts from iTunes backup, transfer contacts selectively to iPhone 6s/iPhone 6s Plus, transfer contacts to iPhone 6s/6s Plus by IosdroneD. Bookmark the permalink.